As an American, learning what I could from books and professors, Japanese garden design seemed almost sacred. I quickly found myself focusing on individual symbolic details of traditional Japanese gardens and how to ‘correctly’ and ‘authentically’ translate these elements within a different cultural context. 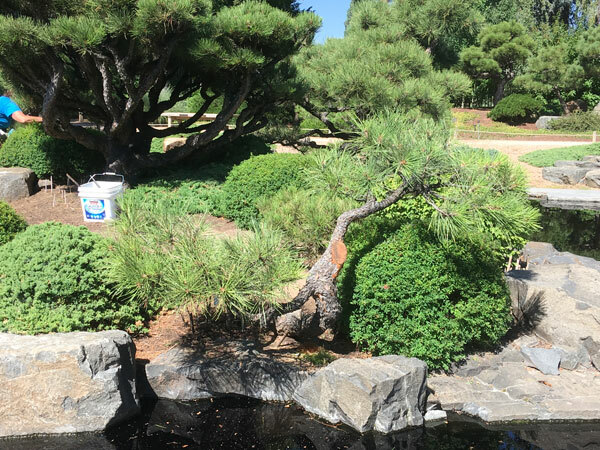 This train of thought easily led to a seemingly inaccessible perception of Japanese garden design that followed me to Denver Botanic Gardens and made me initially wary of everyday tasks for fear of ‘tainting’ the sanctity of the Japanese Garden, Shofu-En. After working extensively in Shofu-En’s sand, tea and strolling gardens, however, I came to understand that the importance of these design elements lies more in the overall experience they help create rather than their correct representation—a concept I had heard before but never fully grasped. In Shofu-En, meticulous tamamono (rounded shrubs) and character pines along with a central pond and island create an uplifting and expansive strolling garden in a surprisingly small corner of the overall campus of the Gardens, while naturalistic trees and shrubs create an introspective tea garden along with indirect paths and traditional water features. Whether this experiential emphasis within Japanese gardens developed more recently due to the current popularity of international styles or has always been integral to Japanese gardens I cannot be sure, but it has definitely affected my present understanding. 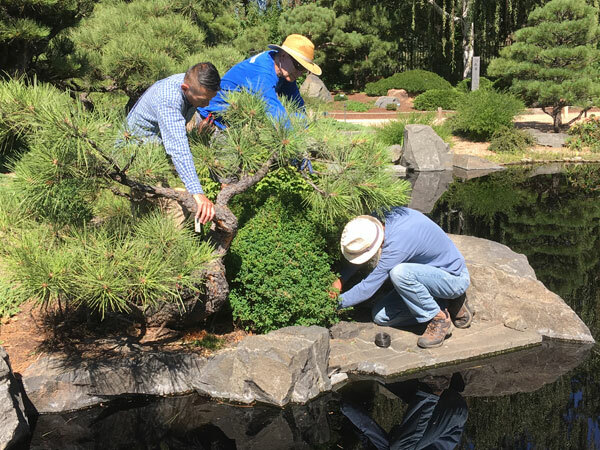 To preserve the atmospheric nature of this garden, a community of volunteers and interns alike work together with the curator to manage the constant maintenance and data collecting Shofu-En requires. Plant records are essential to the maintenance of any garden, providing the curator a tool with which to keep track of any recent work or changes and compare those to changes occurring over the years. This summer, I contributed to an ongoing records project measuring the growth of the many character pines intrinsic to Shofu-En and recording the overall maintenance occurring throughout my internship. Records such as annual growth can indicate tree health, while recording maintenance practices provides a good reference point for the curator in charge and can serve as a rough schedule outlining future projects. Although invisible to the public eye, plant records are essential to the seamless enjoyment of any garden—Shofu-En being no exception. This summer, the trees on Shofu-En’s central island were reduced dramatically to help visually emphasize a single central tree. Due to the abundance of water in their current home compared with their original mountain habitat, the trees on either side of the island had grown too large, reverting to a strong, vertical growth habit and consequently cluttering the hierarchical composition dominated by a central pine. Strategic pruning and needling of these trees returned them to a more desired, horizontal form, diminishing their impact and returning the focus to the larger, central tree while also highlighting the intriguing structure inherent to character pines. This blog post was written by Sophy Fitzcollins. Sophy grew up in Minnesota and is currently a junior at the University of Minnesota, studying plant science and architecture. 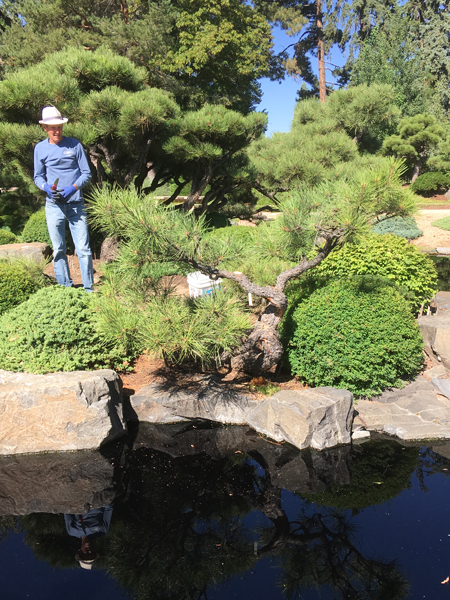 While uncertain of her career path, she is excited to be the Japanese Garden intern at Denver Botanic Gardens to discover new interests.